Body lifted upward in light beam, Hinesville, Georgia, near Fort Stewart and Hunter Army Air Field (HAAF), in April 1974. Drawing by Derek Smith. The object that Derek Smith and his wife saw at the drive-in movie theater in Hinesville, Georgia, near Fort Stewart in April 1974. First it appeared as a bright white light high in the night sky. Then it slowly descended over trees to an altitude of approximately 300 to 400 feet. Drawings by Derek Smith for Howe. “Then it started going through colors from white to red to orange to yellow – like going through multiple shades of each color, stepping through the color spectrum. Then it turned white again and made a clockwise square. It looked like it was drawing a square in the sky. And it made this square three or four times. DS: “Yes. 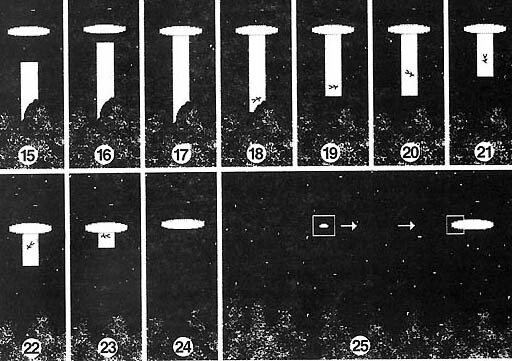 That cylindrical beam actually detached itself from the craft out there and went down toward the ground behind the trees. “Then within a few seconds, a very bright, pure white light beam shot up from the ground to the bottom center of the craft. 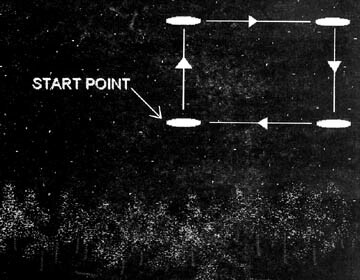 It had the same shape and dimensions as the blue beam and it moved the same way, only in reverse and much faster. 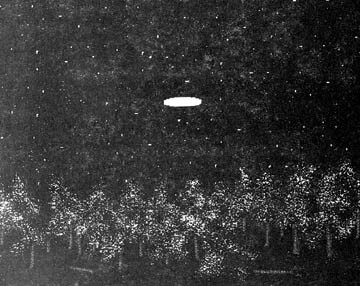 Once the top of the white beam made contact with the bottom of the craft, it began to telescope toward the craft becoming shorter and shorter. DS: “Well, this thing that was tumbling inside that white beam was also sparkling like when a laser sparkles off something. And as this person or thing was tumbling and rotating inside the light beam, the beam which had a distinct bottom to it continued upward until it disappeared inside the craft. Then the object just stayed there hovering, motionless and silent. DS: “Yes, she saw something peculiar in the beam. I had a very intense interest in the object and I wanted to keep looking at it and observing it and trying to get closer to it. However, the closer we got to the object, the more frightened my wife became. She told me that her intuition was telling her not to get any closer to the object and that it was very bad. And she wanted to go home. DS: “Well, that’s what I wanted to do. In fact, I did report it. I went to talk with someone at the Fort Stewart Headquarters Staff. I was relating the story to them and they were kind of like, ‘Yeah, well, sure, thanks, see you later.’ I also remember them saying, ‘It was probably swamp gas. It was probably a balloon.’ And I told them, ‘Look, I’m a pilot. I have over a thousand hours in combat flying. I’ve seen just about everything there is to see in the air. I can tell you that it wasn’t a balloon, it wasn’t swamp gas. I can tell you everything that it was not, but I can’t tell you what it was.’ It was clear they wanted me out of the office, so my wife and I left. “We went from that room into a back room that was blacked out. There were large Plexiglas type screens with glowing symbols on them. Another group of people were working in this room. The Colonel again introduced me, ‘This is Chief Smith and he wants to know about the thing the other night. So, run the tape.’ They ran a tape for me. When it finished, the Colonel said, ‘See there was nothing there.’ Course, I wouldn’t have known what I was looking at anyway because that wasn’t my job and I didn’t know anything about it. “Then he escorted me back outside and said, ‘Appreciate your coming down and glad we could be of service.’ Small talk. For further information, please see my books: An Alien Harvest; the 2-volume Glimpses of Other Realities; and my documentaries A Strange Harvest and Strange Harvests 1993 now available in DVD format in the Earthfiles Shop. 06/27/2008 —More Military Sightings of UFOs in U. K.
07/17/2006 —Area 29 – A Reverse Engineering Center of E. T. Technology? 06/28/2006 —Half Cats in Destin, Florida, and Beheaded Animals in Rochester, N. Y. 04/03/2006 —Genetic Harvest in Cimarron, New Mexico? 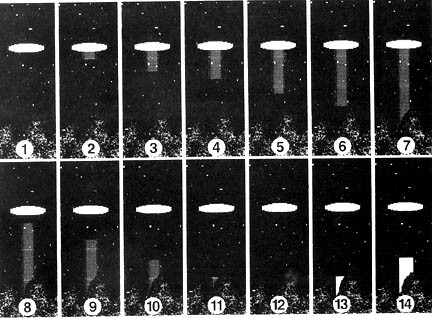 12/04/2004 —Part 1: “Peculiar Phenomena,” V-2 Rockets – and UFOB Retaliation? Next PostNext Red In Fall Leaves – Chemical Warfare?